Inza R. Wood Middle School students learned their artwork will shine amongst the brightest when their art installation was accepted into Portland's fourth annual Winter Light Festival. The light festival, which runs from Feb. 7-9, is a city-wide event showcasing illuminated art installations, performances and kinetic fire sculptures downtown along the North waterfront near OMSI and along the east side of the Willamette River for festival-goers who choose to take the free Portland Spirit boat ride up and down the river to view the art. To fit the festival's theme of "Forward," Wood art students are painting and crafting clay lanterns with text and drawings on each side to represent their ideas about moving forward in their lives. Each side represents an aspect of their lives and where they hope to be in their future. The designs are carved out in their ceramic lanterns so the light can shine through. Seventh-grader Regan Roelofs decorated one side of his lantern to depict the importance of family and vacationing together. "One side of the lantern for us is supposed to mean what 'forward' is for us. I said forward in success and forward in my life," Roelofs said. "I want to be rich and I want to go to UVic (University of Victoria). My dad went there and my two sisters are there right now." And art teacher Troy Mathews thinks the message of "forward" is particularly relevant for students. "These are middle schoolers all about to go forward in life. They're at this weird place where they don't really know what's going on; everything's a possibility and so the idea (is) building lanterns to help them guide them on their way forward," said Mathews, adding that there will be a large structure that will hold the illuminated lanterns. Matthews worked with science, technology, engineering and mathematics teacher Scott Bates — who is spearheading the design of the gazebo-like structure — to submit a proposal to the light festival last summer. And while they didn't know if their idea would be accepted, Mathews had his art students start working on the project prior to being selected as one of more than 100 art installations. Now students are hitting the ground running. "It was an opportunity to get stuff out of our classroom and into the bigger community. 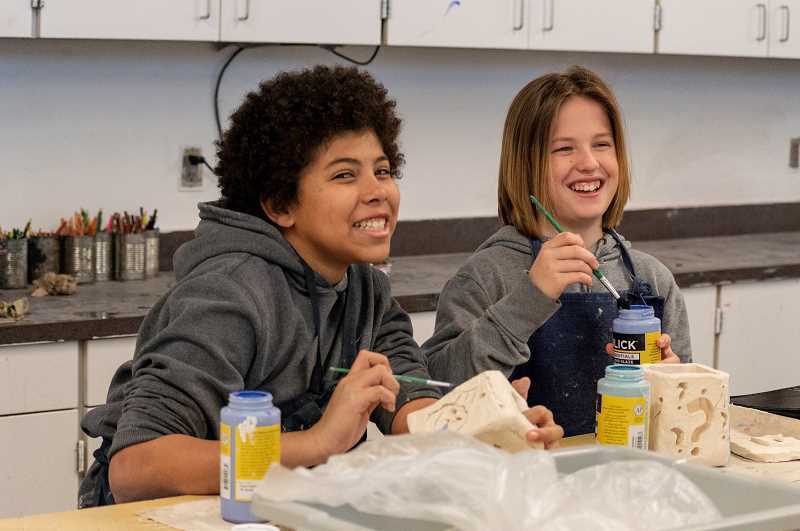 (We're) trying to find ways to get (our artwork) into Wilsonville (and) now into Portland, and trying to get them to think they are students and they're working on these things but their art has bigger impacts on the larger community," Mathews said. "We're not just Wood Middle school; we're not just Wilsonville; we're not just Portland; we're not just Oregon; we're not just the United States, but we are part of a global community. And what they do here matters just as much as anybody else." Matthews said the goal is to be finished with the lanterns by Dec. 21, before students leave for winter break, and the structure will be built in January so everything will be ready to be transported and installed in Portland Feb. 5. Bates describes the wooden structure as an 8 by 16 by 9 foot "bus stop without walls." The roof, which will be black plastic to keep the rain out, will be covered in chicken wire to hold the lanterns by metal hooks. "The reason we're doing that is so that we can fabricate it beforehand and set it up to make sure it's going to work how we want and then we are going to break it down into sections and haul it up there (to the festival). It will be a lot easier to build," Bates said. "You'll see this dark structure and you'll walk in and it will be full of light." When people walk through the structure to see the illuminated lanterns, there will also be audio of students talking about the festival theme, their project and what it means to them. "I wanted mine to be mostly about my life or what I am, so on one side, I am part of the LGBTQ community so I made two sides about my sexuality and one side about my favorite TV show," said seventh-grader Lehua Rooks. "I like how we can make it about ourselves and not specifically about something, so you can be creative with it." After the Winter Light Festival, the structure will serve another purpose: It will provide a covered area for students in the school's courtyard. While students are working hard to complete their portion of the project in time — students will not be helping build the structure for safety reasons — Mathews and Bates said they are looking for volunteers and donations. The project was mostly funded from the school's art budget and funding provided by the Wood Ambassadors — a leadership club of students who help with fundraisers and use a democratic process to determine which projects receive funding. "It was a little nerve-wracking presenting this to our students. I think there were 20 students that day," said Bates, adding that students asked difficult questions and voted on what percentage he would receive of the total amount he asked for. The project received about 90 percent of the funding they requested. "It was just a massive chunk of what we needed," Bates said. "It was the students really supporting the students." One family is donating their barn so Bates and Mathews can build and store the structure prior to the festival, but Mathews said they could use help with the audio recording of the student voices as well as the electrical side of the project. "We are not experts in electricity and light is a huge part of this project so we are still looking for volunteers with experience with lighting," Mathews said.